Switch Chairs : Students all sit in a chair, while the teacher stands in front of the class to start. The teacher then says "switch chairs if you have...(Pink shoes, short hair, blue pants,) every student that falls into that category must switch chairs. The teacher must try to sit in one of the free chairs, leaving a new student without a chair. The student without a chair is then the next one to choose. The teacher will say words in the category, or examples from the topic and students will all repeat together after the teacher. If the teacher makes a mistake (says an unrelated word, or incorrect topic) then students must quickly drop the hoop or rope. The last student holding the hoop or rope is the loser. The loser can give points to the other team or be "OUT". *Students should hold the hoop or rope still and not shake it to fool other children. *If a student lets go when there wasn't a mistake the teacher can award the other team points or have that student sit OUT. *Be sure to play quickly... all students should get a chance to guess a letter. Count down from 5, if things are getting slow. *If students are shy, then have the winner choose who must act next... this will inspire people to really try to win! True and False: Each student stands, or sits on the floor. Each student must tell the teacher a true statement, and a false statement. If the teacher can guess which statement is a lie the student sits down in their seat but does not win. If the teacher cannot guess correctly, the students wins points. Each student plays once. Pictionary: Great for young students. Draw a picture piece by piece, out of any logical order. The first student to guess what it is wins points. Students sit in a circle. The teacher picks a Letter. (Cc) Students go around in a circle saying words that start with "Cc". If a student is too slow, or repeats a "Cc" word that was previously stated, that student loses, and points are awarded to the other team. The student that made the mistake then chooses a new letter and the game continues. Memory: Write words on the board / Draw pictures on the board / Put objects on a table / Show an elaborate picture / Put many flashcards on the ground... Give students 1-2 minutes to memorize them all, then take the memorized things out of sight and ask them to call out what they remember or write them down. Describe a Student: Students sit in a circle facing the outside walls so they aren't looking at each other. The teacher starts the game in the middle of the circle and starts to describe someone in the classroom. (can be done simply with what they are wearing, or difficult, to what they have done in the past) When a student realizes who you are talking about they raise their hand and guess who it is. If they are correct then they are the teacher and sit in the middle of the circle. Once a student has guessed the name of a student, and then described another student then they are "Out" and may sit in their chair. The game continues until everyone is sitting down. *Good for any age because the teacher can choose which grammar they will be using to describe the other people. Also fun because students can say silly things about each other. Anagrams: Great to review the last lessons vocab. Choose some vocab, and write them on the board scrambled. 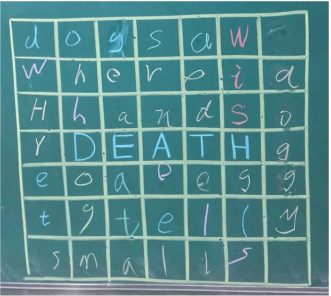 (Dog = ogd) Students win points for each anagram they figure out. Slap Chair: One student from each team sits on the floor next to a small stool. Students put their hands on their heads. The teacher asks a question. The student that slaps the chair first, gets to answer first. The student who answers correctly first is the winner and stays seated on the floor next to the chair. (If the first student to hit the stool answers incorrectly then the other student gets a chance to answer) The loser goes back to their seat, then the next student from that team sits next to the stool to play. Each time a student wins, I give them a finger point. The team that gets 5 finger points first is the winner and is awarded points. 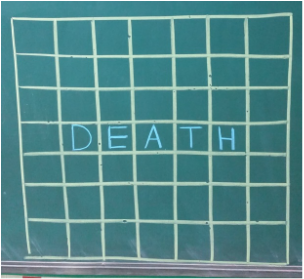 Draw 2 boxes on the board with the words "Death" or anything...in the middle of the box (One for each team). The two teams must race to write words in the box until all of the boxes are filled with letters, or when the time is up (3-5 minutes). Students race one at a time in sequential order. Words must be at least 3 letters long. Each word must use at least one letter that was previously on the board, in their word. Words can be written vertically, horizontally, or diagonally. 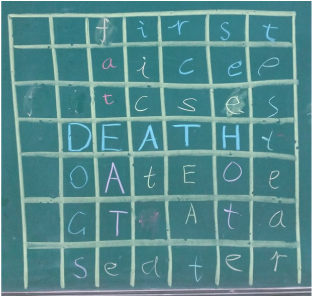 *In the first picture the word "Death" was the first word (One box for each team... identical). The latter two pictures were taken after 4 minutes. *First game was 4 minutes and they almost finished. I then finished all the squares in both boxes for them, after that they fully understood and were begging to play again!